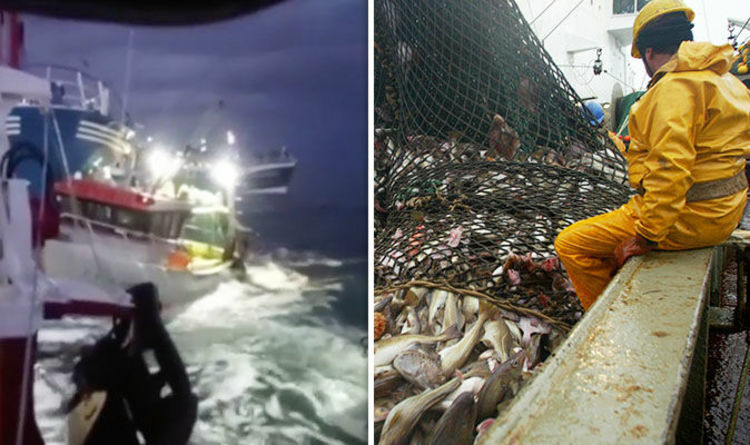 The battle between British and French fishermen took place about 12 nautical miles off the Normandy coast in a fish-rich area where British fishing vessels are allowed to operate legally. The British fishermen were in the majority of up to 35 French ships and the collision left at least three boats with holes in their hulls. Fisherman Paul Lines of Hemsby told BBCRadio Norfolk, "This is an absolute show of arrogance by the French once again.
" We had it all the years. Farmers had it – the lambs and beef. That's just the French. They just can not act themselves. They think everything belongs to them. "They show us arrogance – our fishermen go about their legal business and try to make a living to feed and feed their families, but they face this conflict." Mr. Lines, chairman of the Lowestoft Fish Alliance, insisted that British trawlers do not attack French skippers when they fish off the British coast. He said, "We have the same situation off our coast, we would not have the least dreams of going there and confronting these people, we are civilized." "We sit at a table and talk about it. We do not go out. "They have even fired torches at these ships, which can cause horrendous burns or even set fire to the ships themselves." The Marine stood idly by. " The furious shouting became after the last episode of a protracted battle with France on the large amount of shellfish near the French coast, known as the "Scallop Wars". The French accuse the British of having exhausted their scallop stocks. 9659002] The furious fight did not take place in the 12-mile French or British national restricted zones, which means that British boats are entitled to fish in the area containing a variety of scallops. The British government defended The fishermen said they had a legal claim to scallops in the area. A government spokesperson said: "We are aware of reports of aggression against British fishing vessels in an area of ​​the Channel that is not under British jurisdiction, and these vessels were operating in an area for which they are legally authorized to fish." They added: "The safety of the British fleet is our top priority and we will continue to monitor the presence and activity of vessels in the region, and we are in contact with industry and the French administration to foster meaningful dialogue and further incidents. " Dimitri Rogoff, president of the Normandy Fisheries Committee, told French media:" The French wanted to make contact with the British to prevent them from working. " He added: "Stones were thrown, but there were no injuries or damages." "The French have the The British were practically surrounded before they left the area. "